Partial burnout opportunities on Tough St. were welcomed by Summernats participants. Photos: George Tsotsos. 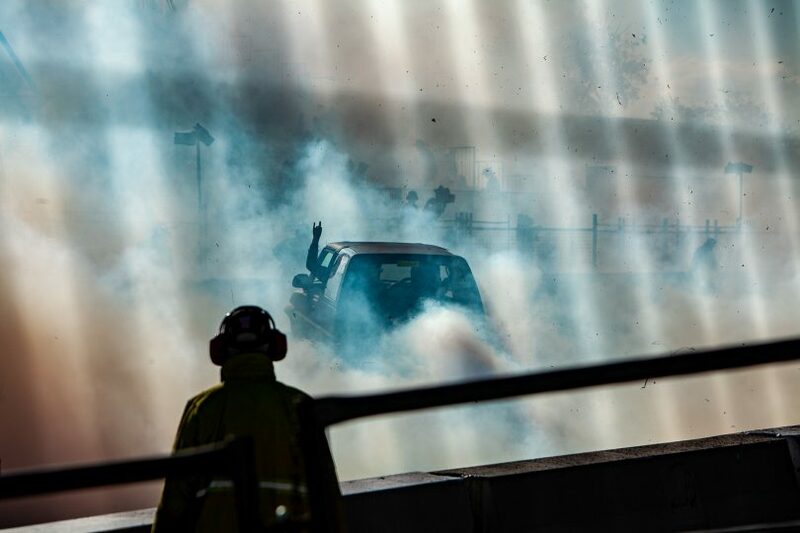 As dense clouds of smoke cleared from EPIC, Summernats organisers say that this year’s festival of cars was marked by good organisation and good behaviour, with the lowest number of “forced evictions” from the event in recent history. “The burnout world record was obviously the main feather in our cap,” Summernats spokesman Adrian Hodgson said. “Our entrants put on a show that’s already been seen by millions around the world on social media. Organisers say that a diversified range of activities gave attendees plenty to do, including the Skid Row section of the cruise route for “people who want to blow off a bit of steam”. In the past, participants haven’t been allowed to do burnouts on the cruise route around Exhibition Park. “We recognised that’s something people would like to do without entering the burnout competition, so we created a stretch called Tough Street, where they could pull into a one direction lane and do a partial burnout under more controlled conditions,” Hodgson says. Huge horsepower contributes to the Summernats excitement for fans. Professional drift drivers were also popular with the crowds – that’s a fast-growing and spectacular form of motorsport where drivers slide around a mapped out course without losing momentum, never accelerating in a straight line. Motorcross backflips also contributed to the colour, sound, smoke, noise and excitement and Hodgson made the point that if spectators are occupied with “a slew of choices”, they’re less likely to create problems. “We are very conscious of the impact Summernats has on the Canberra economy. We like all of Canberra to do well out of us being here, but we’re also aware of our social impact. Our goal is to have a very large net positive effect on the economy but we like to be good neighbours, so we take a lot of advice from government and the police on how to manage these things and debrief with all stakeholders afterwards,” Hodgson said. And for the diehard motor fan, what were the standouts? “There was an absolute stunner of a Ford Cobra, a brand new build complete factory version of the last XE Cobra ever built. It was perfection. Did you go to Summernats? What were the standout features?